Peppermint patties. Chocolate peppermint bark. Peppermint hot chocolate. It’s finally that time of the year when I can be honest and open about my (mildly crazy) chocolate peppermint addiction. While it’s super tasty, it’s not fun having to explain why you are eating peppermint ice cream in a chocolate dipped cone in the middle of summer. It’s worst having to justify why you have such an abundance of candy canes in the middle of July. However, come the -ber months, it’s perfectly normal and encouraged to eat your weight in chocolate peppermint galore. 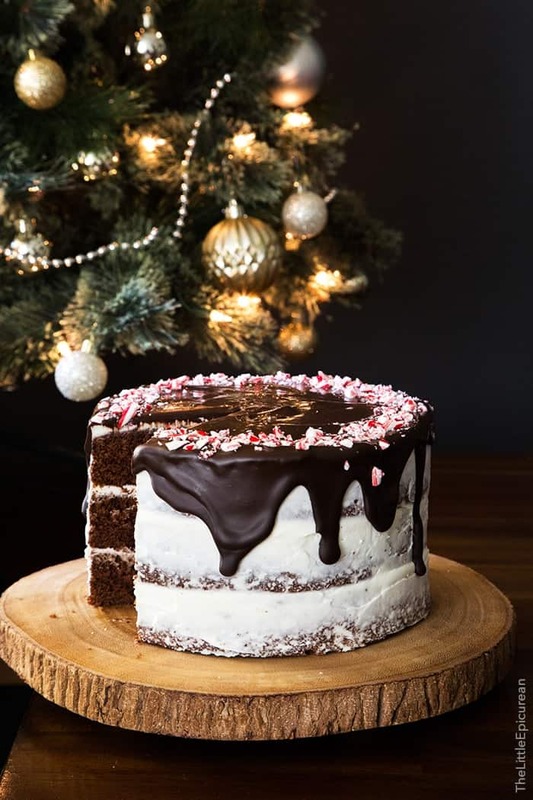 I’m kicking off December with this rich, decadent, and oh so delightful chocolate peppermint cake. This cake has three thick layers of chocolate cake. It’s encased in a sweet and creamy peppermint buttercream. I used peppermint oil (one of my favorites!) to flavor the buttercream. Peppermint oil is much stronger and way more potent than peppermint extract. Be extra careful when using it. A little goes a very long way. Peppermint oil tastes a lot cleaner and fresher than extract. Some peppermint extract tastes a bit “fake” to me, almost like toothpaste. This peppermint oil makes simple buttercream taste like a York Peppermint Patty (which I absolutely LOVE). I’m super into this barely frosted cake look. If you’re not into that, no worries. The buttercream recipe makes plenty. You’ll have more than enough to full frost the sides of the cake. 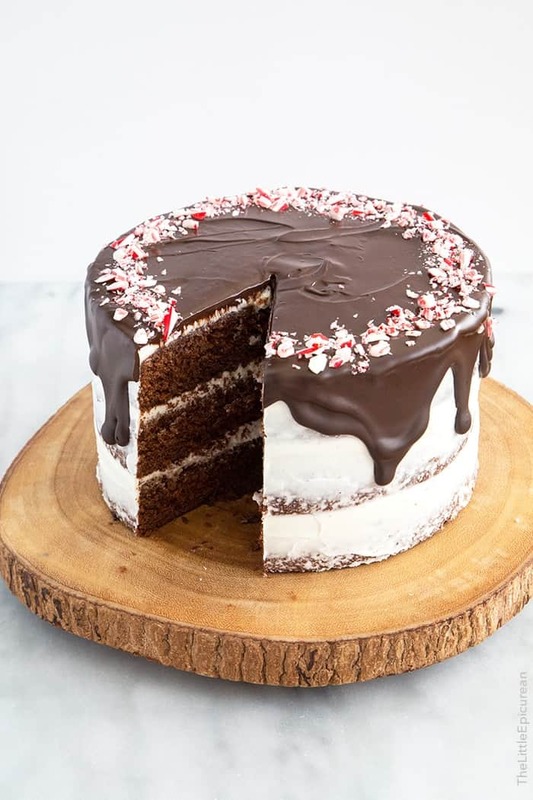 And because one can never have too much chocolate peppermint, I poured melted chocolate over the frosted cake and sprinkled some crushed peppermint candy canes on top. You can serve this cake two ways. One: Pour the melted chocolate right before serving. The chocolate will remain ooey gooey. Two: Prepare the cake ahead of time and allow the melted chocolate to set up in the fridge. The chilled chocolate will harden, leaving you with an almost chocolate peppermint bark topping. 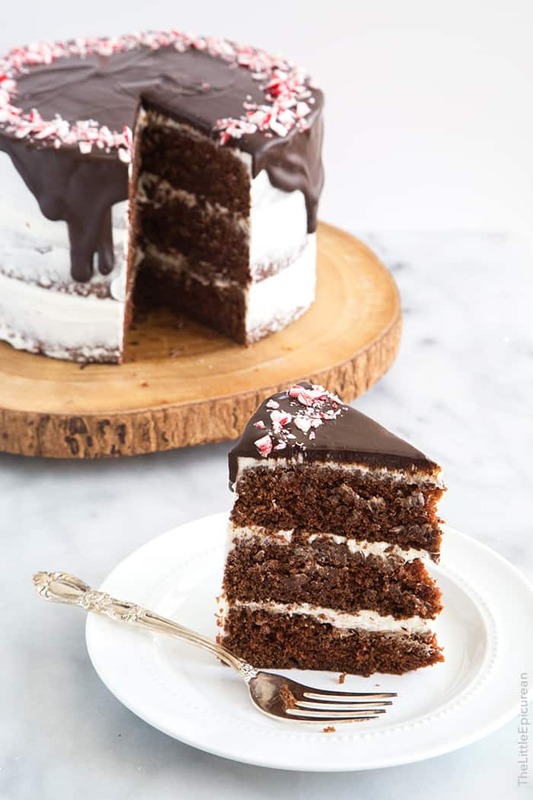 Chocolate peppermint cake is the quintessential holiday cake. 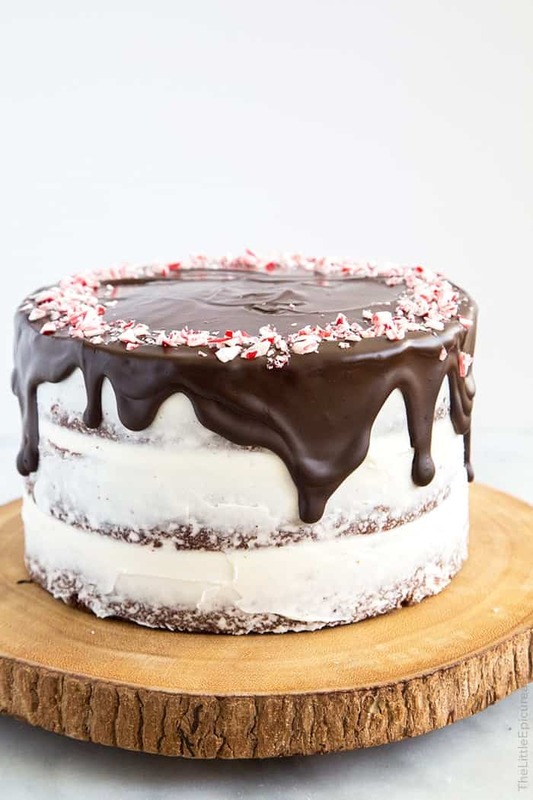 Three layers of chocolate cake encased in a sweet and creamy peppermint buttercream and topped with rich melted chocolate and a sprinkling of crushed peppermint candy. Preheat oven to 350 degrees F. Line three 8-inch cake rounds with parchment paper. Lightly grease and set aside. In the bowl of a stand mixer fitted with a paddle attachment, beat butter until smooth. Add brown sugar and granulated sugar and mix with butter until smooth. Add eggs and vanilla. Mix on low speed until incorporated. Scrape down bowl as needed to ensure thorough mixing. In another bowl, mix together cocoa powder, espresso powder, and hot water. Mix until smooth. Allow to cool slightly. Add 1/3 of flour mixture to mixing bowl. Mix on low speed until almost incorporated. Add sour cream and mix until combined. Add another 1/3 of flour mixture, followed with all of cocoa mixture. Mix on low speed. Add remaining 1/3 of flour mixture. Continue to mix on low speed until batter is smooth and thoroughly combined. Divide batter among prepared cake pans. Use the back of a spoon or a mini offset spatula to level cake batter. Bake for 30-35 minutes until toothpick inserted in center of cake comes out clean. Rotate pans midway through baking. Allow to cool in pan for 5 minutes. Run a knife or offset spatula to loosen cake from pan. Unmold and allow to cool to room temperature on a wire rack. In the bowl of a stand mixer fitted with a paddle attachment, beat butter until smooth. Add powdered sugar and peppermint oil. Mix on low speed until buttercream is smooth. Scrape down bowl as needed to ensure thorough mixing. Increase speed to medium and beat until buttercream is airy, smooth, and creamy. If necessary, level cake layers. Place one cake round on a cake turntable. Spread about 1/2 cup of buttercream on cake using an offset spatula. Place second cake round on top. Spread another 1/2 cup buttercream. Place final third layer on top and spread another 1/2 cup buttercream. Spread buttercream around the cake to create a "crumb coat" layer to seal in any crumbs. Chill cake in the fridge for 15 minutes to set frosting. If desired, generously coat the chilled cake with additional buttercream. Drizzle slightly cooled, melted chocolate over frosted cake. Immediately sprinkle crushed peppermint over chocolate. Serve immediately, or let chill in the fridge until ready to serve. Chocolate will harden in the fridge. Pour melted chocolate before serving, if you want to keep the chocolate liquid. Peppermint oil is NOT the same as peppermint extract. To substitute peppermint extract, double amount or adjust according to taste. Peppermint oil is much stronger in flavor in more potent than peppermint extract. This is the first year Alex and I set up a Christmas tree in our home! It’s fairly small (at 4 1/2 feet) but it fits perfectly in our tiny living/dining room. It’s one of those fake trees (but looks real!) with pre-attached lights. While it would have been lovely on the floor by the fireplace, we had to place it on top of a side table because Taylor (the younger pup) immediately took a liking to the branches. Oh my, such an elegant looking design. I Love it. Oh it’s Christmas in a cake! This would make an absolutely divine centerpiece for any holiday celebration! We are choc-mint lovers in our family – all year round! My sister and brother-in-law even had a chocolate mint layer in their wedding cake! I just know the whole family would be delighted with this for Christmas dessert, and the chocolate peppermint bark type frosting – divine! Oh my. This cake is absolutely GORGEOUS! Why in the world would you ever have to justify your peppermint love?! Other people are crazy if they don’t get it. ;) And this cake is so cute! I love the barely frosted look, too. I’m so in love with your dessert! Peppermint and chocolate go so good together! This has to be your best cake yet!! 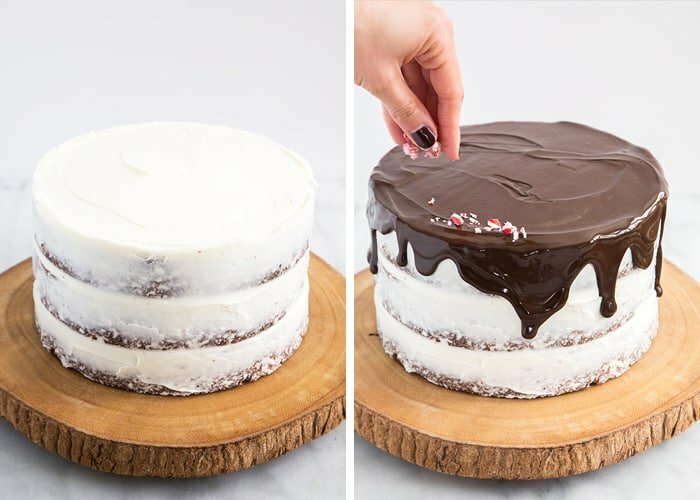 Chocolate + peppermint are truly soul mates, I imagine they are just lovely in this cake :) Love that last photo too, truly captures the Christmas spirit! Seriously, what an exquisite cake. Simply stunning. I made this cake and it was a serious winner! Make this cake! It was so so so good! My entire family loved it too. Thanks for the recipe! Hey! Ths cake looks absolutely amazing!! 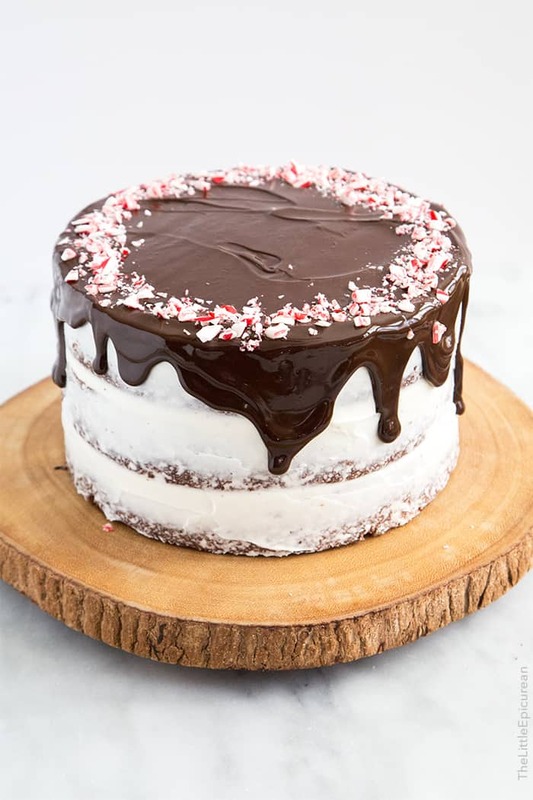 I was planning on doing a barely frosted look (similar to yours) but im worried there wont be enough peppermint flavor without all of the frosting present on the cake. Considering adding some peppermint extract to the cake. What do you you think? Hi Brianna, I used peppermint oil in the frosting, not peppermint extract. Peppermint oil is much more potent than extract. The peppermint buttercream is very minty as is. 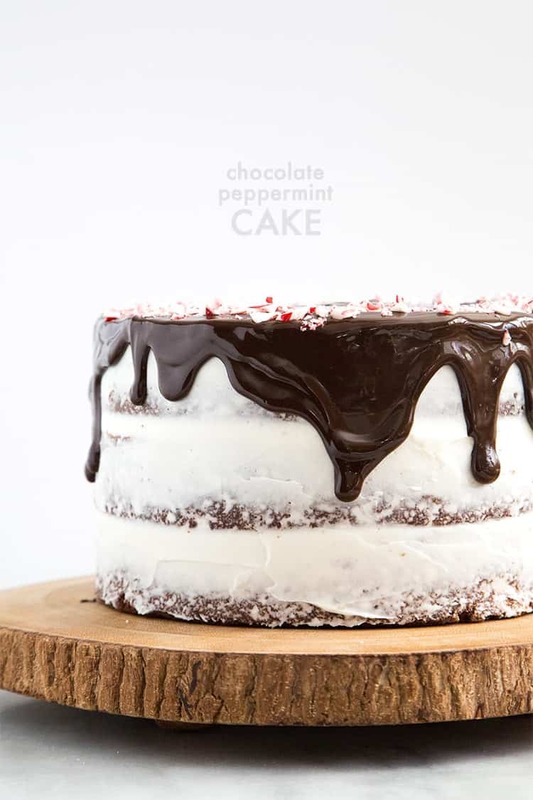 I wouldn’t add peppermint extract to the chocolate cake because the amount of cocoa powder in the batter will likely cover up any additional flavors when baked. Hope that helps! Thanks so much, I cant wait to make this cake!! So I thought I had inch cake pans and I don’t… can I use two 9inch and change the cook time? I know it won’t be as tall and elegant as yours pictured. What do you think? Thanks! So I thought I had 8 inch cake pans and I don’t… can I use two 9 inch and change the cook time? I know it won’t be as tall and elegant as yours pictured. What do you think? Thanks! Yes, you can use 9-inch cake pans. Simply reduce baking time by a few minutes. I made this cake for my Dad’s birthday. It was delicious. I decorated the top with chopped up mint Kit Kats. The cake was very moist and everyone enjoyed it. The buttercream recipe as stated is very generous so I would reduce it by at least a third next time. Thanks for the recipe. Happy belated bday to your father! Thank you for trying out the recipe!